Hershey Creamery | AS/RS Case Study - Westfalia Technologies, Inc. Since 1894, family founded and owned Hershey Creamery Company has specialized in bulk ice cream novelties. The company distributes to more than 22,000 retail outlets such as grocery and convenience stores, but focuses mainly on direct-store delivery. 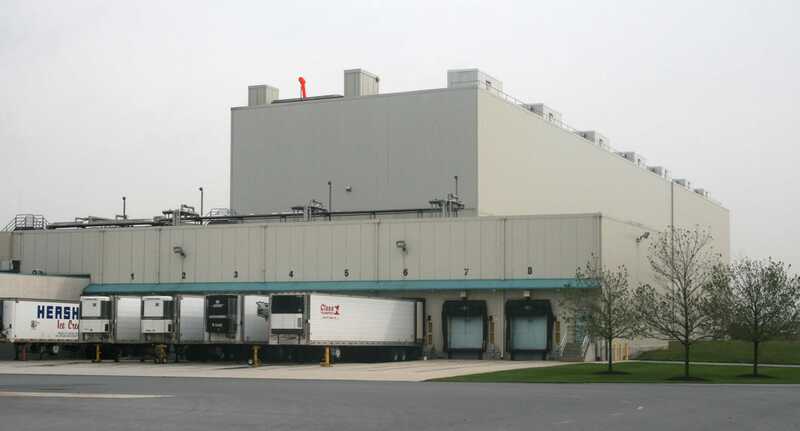 In 1997, in order to optimize material flow, reduce logistics costs and labor requirements, Hershey Creamery sought Westfalia Technologies, Inc. to design and build a warehousing system for their new ice cream distribution center located in Middletown, PA. The distribution center was needed to handle the volume of smaller direct-store deliveries and larger orders for Hershey’s regional warehouses, while maintaining selectivity for numerous stock keeping units. Westfalia initially designed and built a 5,000 pallet position, eight storage level automated warehouse system incorporating pick tunnel operations. 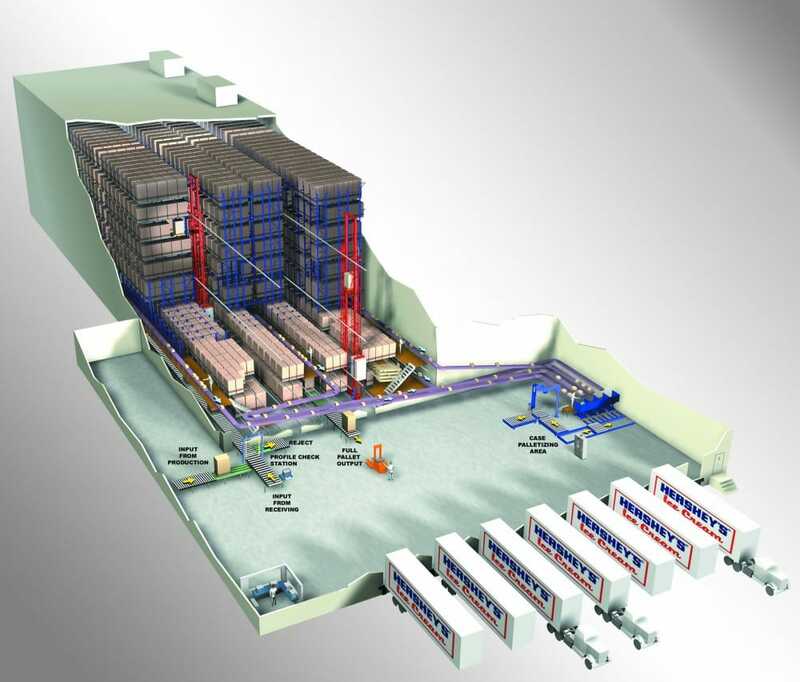 The 2 aisle system has a combination of seven- and five-deep storage lanes. 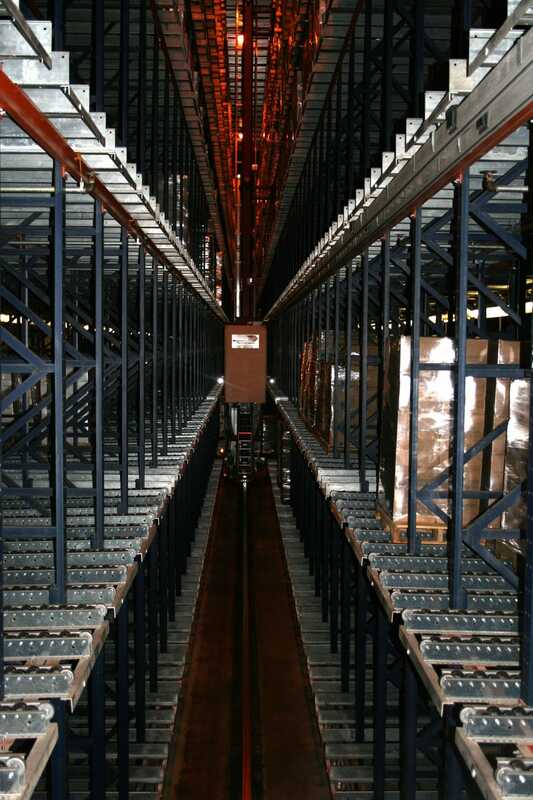 Each aisle contains one S/RM capable of handling approximately 70 pallets per hour. 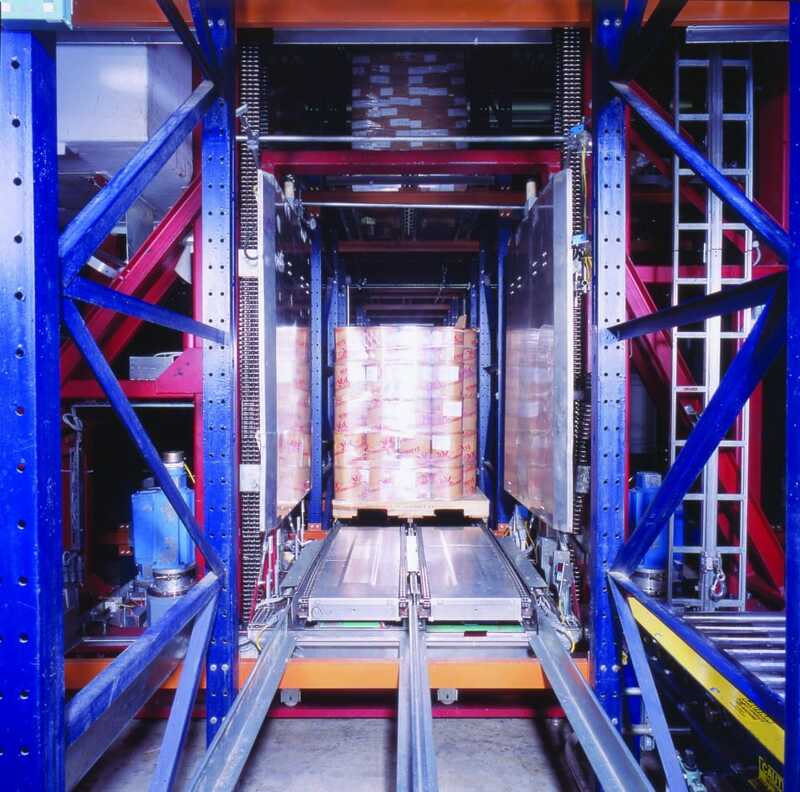 All pallets are triple supported within the rack structure, thus eliminating pallet damage. 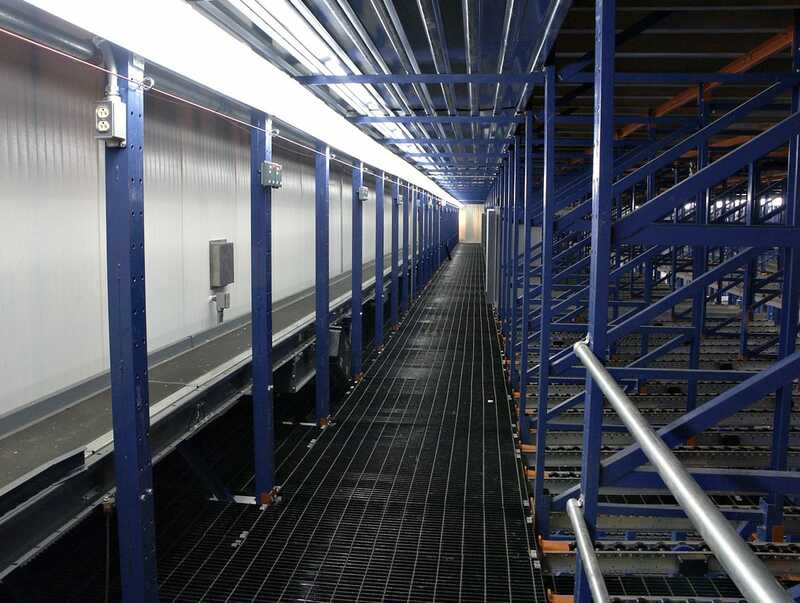 About 5 years later, due to their growing demand, the system was expanded—aisle lengths were increased 50% and a 3rd level of pick lanes were added within the rack structure. At that time Westfalia’s Warehouse Management Software (WMS), Savanna.NET® was installed too. With these additions Hershey Creamery has been able to deliver its products faster and more efficiently with higher throughput capabilities. Parameters were established for Westfalia’s AS/RS design; including the fact that FIFO inventory management must be maintained. One SKU is stored in each storage lane, and the fastest moving SKU’s are placed in storage lanes as close to the input / output conveyors as possible. 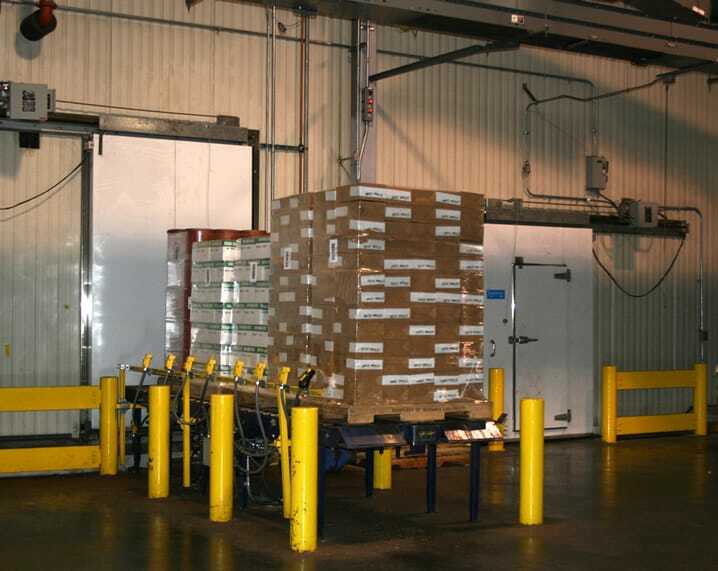 By storing the pallets in two different lane depths, the warehouse is able to meet the throughputs of the fast moving “A” products in the longer lanes, and the slower moving “B” products in the shorter lanes. This mix of lane depth increases rack utilization. Hershey Creamery’s picking operations require both full pallet and case picking. After pallets have a print & apply label attached to their side, they enter the automated system from forklift trucks via a Right Angle Transfer (RAT) conveyor. Each pallet, Hershey uses two types, GMA and a smaller one, is conveyed to a squaring station where it is centered on the conveyor, profile checked, and scanned for identification. At the profile check, the sensors detect if the height, shape or weight of the pallet fits the unit load envelope. If a pallet fails the profiles check, it is rejected and moved to the reject lane. Rejected pallets stay in this palletizing area for correction by an operator. Approved pallets are then assigned a storage position by the Warehouse Management System (WMS) and conveyed to the infeed of either S/RM, in either aisle. Westfalia’s Satellite® rack entry vehicle smoothly and quickly places the pallet off the S/RM and in the storage lane where it belongs. The -40F degree deep-freeze environment hardens the ice cream for 24 hours before shipping. All pallets are tracked throughout the system by Westfalia’s WMS. When selected for shipping, it directs the movement of the pallet either into the pick tunnel or the shipping dock via the Satellite® and S/RM, and onto conveyors. Order selection is performed outside the control of the WMS. Cases of ice cream novelties are order-picked within the rack’s second and third levels. Using a pick-to-light system employees pick the number of cases required and place them onto a belt conveyor, leading down to the palletizing area for outbound shipping. As a pallet enters the AS/RS, information is gathered by the WMS, including SKU#, height, weight, description, special storage classifications, shelf life, and the number of days a product can bypass FIFO delivery. An operator can easily add, change or delete this information. The WMS issues a broad range of standard reports to instantly keep track of inventory and product flows. Reports can be generated based on SKU, storage lane, pallets, S/RM communications, missions (missions are the S/RM activities moving a pallet in and out of a storage lane), transaction log, pick tunnels and pick face assignments. User privileges authorizing access to portions of the software system are pre-determined by a warehouse supervisor. Westfalia’s WMS is amazingly user friendly. With tab-style screens and its intuitive, easy to read format, operators quickly and easily learn how to use the system. Westfalia provided a full training package with the system installation. Ten years on, Hershey Creameries is extremely satisfied with their automated warehouse. In fact, Hershey Creameries is planning further upgrades to their Storage and Retrieval Machines to improve their efficiency now that their controls are 10 years old. Updating the controls will make them work even faster and smoother. With their continuous improvement efforts, ice cream lovers everywhere can be assured their sweet treats will be ready and available when needed for years to come.